I've been wanting to try "The Department" for quite a while now, and I'm glad I did. 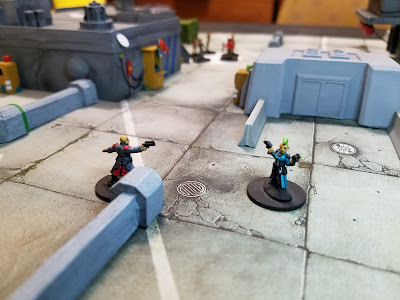 Noir Investigative Skirmish! Check it out! It reads like a lot of fun, great table layout really helps the story. I wrote to the author of the Kickstarter for advice on where to obtain the book as you have done a great job of piquing my interest as I did some googling and it certainly isn't easy to find unless of course, it's just me being old again lol! Please chip in if you have a direct link, that would be even more helpful and thank you again for sharing such a different take on skirmish games in general. Thanks for the assist, OneHuaiTicket! And thank you for the kind words, Raptoruk369! I don't know where I got the PDF originally. Probably Drive-Thru RPG. (Weird that it's not on WargameVault.) It was three or four years ago. Then I had to track down the kickstarter and email the author, but I didn't get a reply. A year later, I tried again. Eventually he hooked me up with a leftover physical copy. These books have been printed once. I don't understand why they aren't PoD from Drive-Thru RPG or Lulu or something. It's like free money! Nice AAR and a great looking table! Nice looking game and a fun aar. I got these rules when they were a KS long ago. I don't know why they didn't take off more. I have always enjoyed them.